Looking for an additional opportunity to win tickets? Zaxby’s will be hosting a live ticket giveaway on 4/19/2019 at their 6017 W. Reno Ave. location in Oklahoma City. Zaxby’s will be giving away five pairs of Thunder tickets during the opening playoff games against the Portland Trail Blazers. Customers wearing blue or sunset who visit in-store from 11 a.m. to 1 p.m. on 4/19/2019 are eligible to enter for a chance to win one of five pairs of Thunder tickets to that evening’s game. Entries will be limited to one pair per person, and you must be 18 years of age or older to enter. 40 pairs of tickets for all Thunder home games will be given out via Zaxby’s Thunder Rewards Zone. Participants fill out the entry waiver to be entered for a chance to win a pair of tickets to the specified Thunder home game. Make sure the name you enter matches the name on your photo ID. If you are a winner, you must present a valid, non-expired photo ID to pick up your tickets. Please note: We cannot accept photocopies of IDs. Both the winner and their guest must be present in order to claim your tickets. If you are selected as a winner, you will receive an email at least four hours prior to tipoff with further instructions. IMPORTANT: Winners have 30 minutes to claim tickets beginning no sooner than 1 hour prior to tipoff. If you do not claim your tickets by the deadline corresponding to tipoff that game they will be released. (Ex. 7:00 p.m. tipoff means winners have from 6:00 p.m. - 6:30 p.m. to claim tickets before they are released). Seats are assigned randomly at the discretion of Zaxby’s Thunder Rewards Zone staff and cannot be transferred to other people or games. Where do I pick up my Zaxby’s Thunder Rewards Zone tickets during the Playoffs? Zaxby’s Thunder Rewards Zone for playoffs will be located at the WEST ENTRANCE to Chesapeake arena. To collect your winning tickets, utilize the doors closest to the arena wall. There will be Zaxby’s Thunder Rewards Zone signage to designate the specified area. Is the Zaxby’s Thunder Rewards Zone available for every Thunder Playoff home game? Yes, 40 pairs of tickets are given out for every playoff home game! The exact timing of the Zaxby’s Thunder Rewards Zone varies with tipoff times. When will the playoff games be posted on okcthunder.com/rewardszone? All games will be posted on okcthunder.com/rewardszone 24 hours after the schedule for each playoff round is announced. You may sign up for each home game within the specified playoff round in advance though there is no guarantee the latter games will play. Games will be listed as, “Round 1, Home Game 1” and so on. How many times can I enter online to win Zaxby’s Thunder Rewards Zone tickets? You may enter once per game date. To submit your entry for more than one game, please fill out the form once for each date. Multiple entries for the same game date will not be accepted. May I enter the Zaxby’s Thunder Rewards Zone if I am under the age of 18? As outlined in the terms and conditions, Zaxby’s Thunder Rewards Zone entrants must be at least 18 years of age. Winners will need a valid photo ID that exactly matches the first and last name of the entrant in order to receive the tickets. Ticket winners are welcome to bring a person under the age of 18 as their guest. What time can I expect to hear if I won or lost after signing up online? Entrants will be notified via email at least four hours prior to tipoff. Zaxby’s Thunder Rewards Zone seating is typically located in Love’s Loud City. The exact row and seats are distributed at the discretion of Thunder staff. Seats for each ticket pair are adjacent to one another. Can I leave and come back once I have received my tickets? If you win tickets, you will be directed into the arena promptly after receiving your tickets. We suggest winners and their guests arrive an hour before tipoff and plan to enter the arena immediately. Remember, any tickets not claimed at least 30 minutes prior to tipoff will be released. Will there be an unclaimed ticket line? No, there will not be an unclaimed ticket line. The tickets that were not claimed in by the winners randomly selected through the online model will be given away in Love’s Thunder Alley via the official Oklahoma City Thunder social media prior to tipoff. If I did not win through the online Zaxby’s Thunder Rewards Zone, do I still have a chance to win tickets? Yes, be present in Thunder Alley prior to tipoff and follow the official Oklahoma City Thunder social media accounts closely for a chance to win. What is the role for Social Media for Zaxby’s Thunder Rewards Zone during the playoffs? Social media will give away 5 pairs of tickets for every home game. Tickets will be given away on the same game day of each home playoff game. 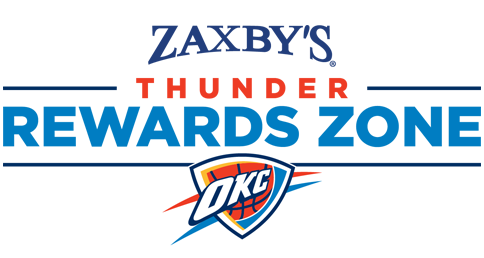 The official Oklahoma City Thunder social media team will conduct the ticket giveaways at their discretion. The ticket giveaways can include, but are not limited to: rewarding social engagement such as posts, shares, tweets, retweets, hashtags, etc. as well as participation at Love’s Thunder Alley. What social media outlets will be utilized for distribution of remaining tickets? Twitter, Facebook and/or Instagram will be utilized for ticket giveaways. Follow the official Oklahoma City Thunder accounts. Are there any requirement for ticket winners? All ticket winners must agree to enter the arena directly after receipt of the tickets. Both the winner and guest must be present in order to claim the tickets. For safety and security purposes, those who refuse to enter the arena as soon as possible will have their tickets revoked and another winner will be selected.